This page provides you with Engineering Intern resume samples that you can use for inspiration in writing your own resume, or for creating one through our easy-to-use resume builder. Below you'll find our how-to section that will guide you through each section of a Engineering intern resume. First of all, congratulations on your graduation: you are now an engineer! We get it, we have all been there: you’ve recently graduated and you feel like you lack significant experience. You have little idea on how to write the best resume for an engineering intern and you don’t know where to start. Well, let’s start from the fact that you’ve landed on this page, most likely looking for the best engineering intern resume sample on the web: that’s already a first step! We are here to help you building that standout resume that will convince the recruiter to give you a chance and to invite you to the office for an interview: we can’t wait for that moment! Now, your resume is your introduction: to the recruiter, to your future employer, to the company and to the job itself. Don’t rush, sit down and relax because this extremely important step of the process will define your future couple of years. Let us inspire you, we have already helped thousands of engineering interns like you getting the dream job they were hoping for! Use a friendly yet professional tone, don’t be too simple nor boring: and please, don’t be funny! This is not a conversation you’d be having at the cafeteria! Clear, powerful fonts are a must: even if you’re very young, basic fonts are your best option as they can be more impressive than one that’s impossible to understand for the recruiter. Big headings, clean white spaces and no typos are fundamental, too! Last but not least: save your resume as .pdf, as unfortunately MS Word won’t keep your layout intact. How many engineering interns resume would you say a recruiter and hiring manager get on a weekly basis? The competition for engineering interns is insanely fierce and many of you lack experience: you can win the recruiter’s attention in one way, and that’s through your summary. In fact, this is your 60-second pitch to the recruiter, your chance to convince them that you are worth scrolling down your resume. What skills have you worked on during college that can match the job description? This is a very important section for a engineering intern resume as client’s are searching for specific skills that their hire must have to complete the job. Say you’re good at workflow management if you are not! If you believe an excellent Engineering Intern Resume sample is not enough for you, well we’ve got something else. 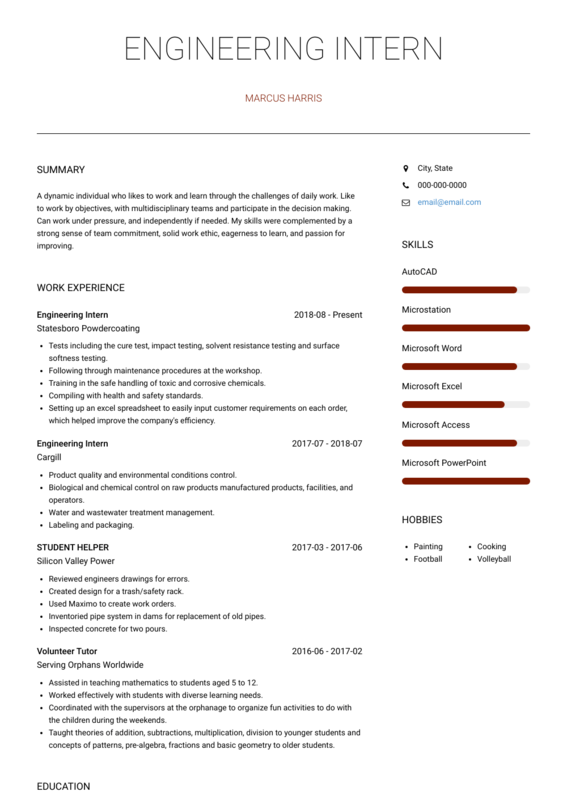 Check out this marvelous piece of work we have worked on: the most efficient Engineering Intern resume templates in the market! Many professionals like you have successfully used it to take their career to the next level.